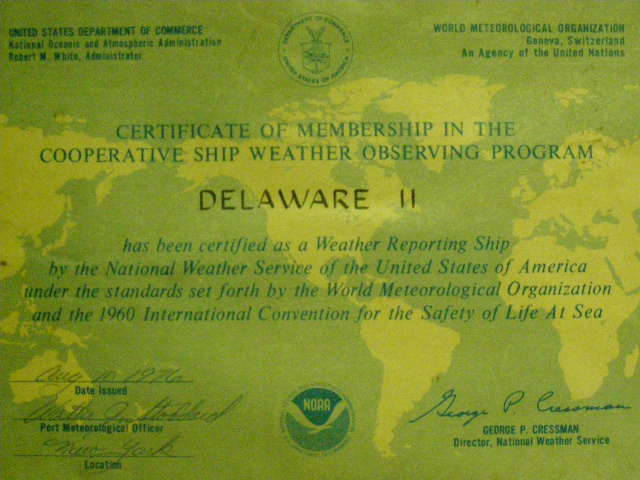 Geographical area of cruise: Northeastern U.S.
UNCLAS //N03144//MSGID/GENADMIN/NAVMARFCSTCEN NORFOLK VA//SUBJ/WEAX/NOAAS DELAWARE II//REF/A/MSG/NOAAS DELAWARE II/301900ZJUN08//REF/B/WEB/NOAA SHIP TRACKER/011147ZJUN08//NARR/REF A IS MOVREP. REF B IS NOAA SHIP TRACKER PAGE.//POC/SHIP ROUTING OFFICER/-/NAVMARFCSTCEN/LOC:NORFOLK VA/TEL:757-444-4044/EMAIL: MARITIME.SRO(AT)NAVY.MIL//RMKS/1. METEOROLOGICAL SITUATION AT 011200Z:LOW PRESSURE OVER QUEBEC WILL RETROGRADE WESTWARD AS ASECOND LOW FORMS OVER LABRADOR. THE ASSOCIATED COLD FRONT EXTENDS SOUTHWEST FROM THE GULF OF ST. LAWRENCE ALONG THE COAST TO NORTHERN FLORIDA. THE TRAILING EDGE OF THE COLD FRONT WILL SLOWLY DISSIPATE OVER THE WESTERN ATLANTIC. HIGH PRESSURE OVER THE NORTH CENTRAL ATLANTIC WILL REMAIN STATIONARY AND INTERACT WITH THE FRONT AS IT MOVES OFF THE MID-ATLANTIC COAST. ANOTHER LOW PRESSURE SYSTEM FORMING OVER ONTARIO WILL MOVE EAST-NORTHEAST TOWARDS LABRADOR THROUGHOUT THE PERIOD. 2. 24 HOUR FORECAST COMMENCING 020000Z FOR YOUR MODLOC AS INDICATED BY REFERENCES A AND B. A. SKY, WEATHER: PARTLY CLOUDY TO OCCASIONALLY MOSTLY CLOUDY. EXPECT PATCHY COASTAL FOG OVERNIGHT AND EARLY MORNING. B. VSBY (NM): 7, 1 TO 3 IN PATCHY COASTAL FOG. C. SURFACE WIND (KTS): SOUTHWEST 5 TO 10, INCREASING 10 TO 15BY 03/00Z. D. COMBINED SEAS (FT): SOUTH-SOUTHWEST 3 TO 5, GRADUALLYABATING 2 TO 4 BY 02/12Z. SEAS WILL BE LOWER IN PROTECTED WATERS. OUTLOOK TO 48 HOURS: WINDS SOUTHWEST 10 TO 15, INCREASING 18TO 23 WITH GUSTS TO 28 AFTER 03/12Z. SEAS SOUTH-SOUTHWEST 2 TO 4,BUILDING 4 TO 6 BY LATE PERIOD. SEAS WILL BE LOWER IN PROTECTED WATERS. The mission of my trip with NOAA is to provide me (a teacher of third grade students) an extraordinary opportunity to take part in genuine-world experiences being conducted by NOAA in order for me to achieve a clearer insight into pour ocean planet and a superior understanding of NOAA-related careers. With the comprehension that I obtain, I will be able to make lesson plans created on my field study for my students, giving them insight as to how much power they have on their lives and this world we live in. I will be able to generate lesson plans allowing my students to play a part in maritime activities as we study together, to value the work and expertise that is required to sustain oceanic and atmospheric research. The students’ enthusiasm, inquisitiveness and yearning to learn will only heighten with the hands-on, motivational activities that I gain from my research with this NOAA team. The educational experience that I gain from NOAA will certainly provide for an exceptional setting for knowledge and instruction. 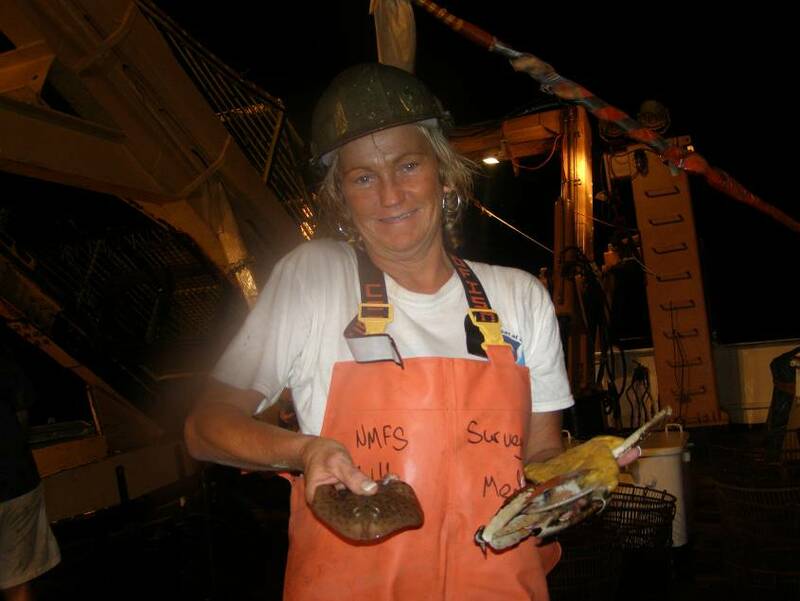 Why Does NOAA Conduct Clam Surveys? Clams are a very important part of economy and ecology along the eastern United States Coast. NOAA is keeping track (surveying) of clams for the purpose of conserving clams to stabilize fishery industries without wiping out the clam population completely. Clams play a very important part in marine ecosystems; therefore these surveys are helping to maintain stability in the economy and ecology of United States. Today was our second day at sea. Our ship departed from Woods Hole, Massachusetts yesterday at 3:30 p.m. So that new crewmembers could learn their jobs and responsibilities from our Chief Scientist (Vic Nordahl), we participated in a “practice” dredge. 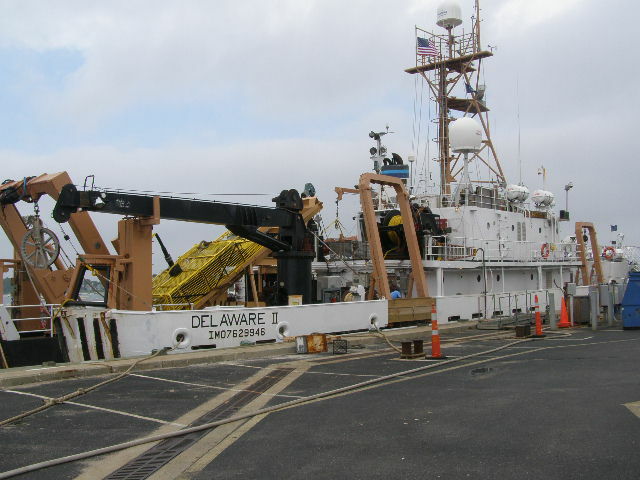 On Monday, June 30th – the crew onboard The Delaware II undertook our first clam survey (Station 1). I was on the 12:01 a.m. night crew. I was put in charge of operating the power switch for the clam dredge. The dredge operator (Lino Luis; THE LEAD FISHERMAN) would radio me when the dredge was set into the water, radio me again when he was preparing to dredge “hauling” and then radio me “GIVE ME POWER”. At this point, I would check the DEII device, which read the meters of the surface voltage, which detects the power for the speed of the ship. This machine needs to read between 2.5 and 3.0 knots. Wearing a rubber glove and standing on a rubber mat, I immediately turned the switch on the SURF CLAM CONTROL to “ON”. This supplied the dredge with approximately 900 amps (A-C AMPERES) and a voltage of approximately 450 volts. As soon as I turned on the switch, I would radio back to Lino “THE POWER IS ON!” He would radio me back when it was time to turn off the power switch (after the dredger was off the bottom). He would signal to me “Turn the power off”. I would turn the switch to off and radio him back “POWER OFF”. 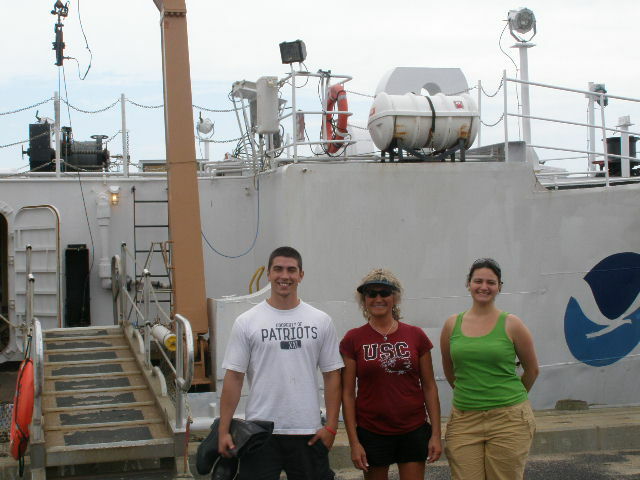 NOAA Teacher at Sea, Lisha Hylton (center), stands in front of the DELAWARE II with some fellow ship mates. 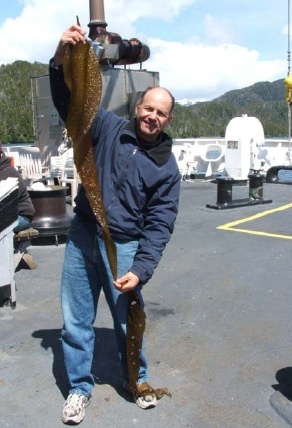 Once the clam dredger was hauled onboard the back deck of the ship and the dredger was secured and inspected by Vic Nordahl (Chief Science Researcher), the clam load was released. Wearing protective clothing and hardhats, the crew began to sort the variety of marine animals. Richard Raynes (Gear Specialist) and I were involved in this task. Large buckets were used for this purpose. Broken quahogs were separated from undamaged quahogs. Surfclams went into another bucket. Other living sea creatures like sand dollars, stingrays and sea scallops along with shell fragments and sediment were put into a separate bucket and immediately released back into the ocean. I worked closely with Vic Nordahl and Francine Stroman (Biological Technician) watching, learning and participating in sorting the load and recording data for Station 1 Clam Survey. The clams were weighed and counted (this data imported into a computer system). The second step was measuring the length of the clams on a LIMNOTERRA (a measuring board) and importing this data into the computer system as well. I assisted in the sorting, weighing, counting and measuring. Once the data was stored, the clams were released back into the ocean. 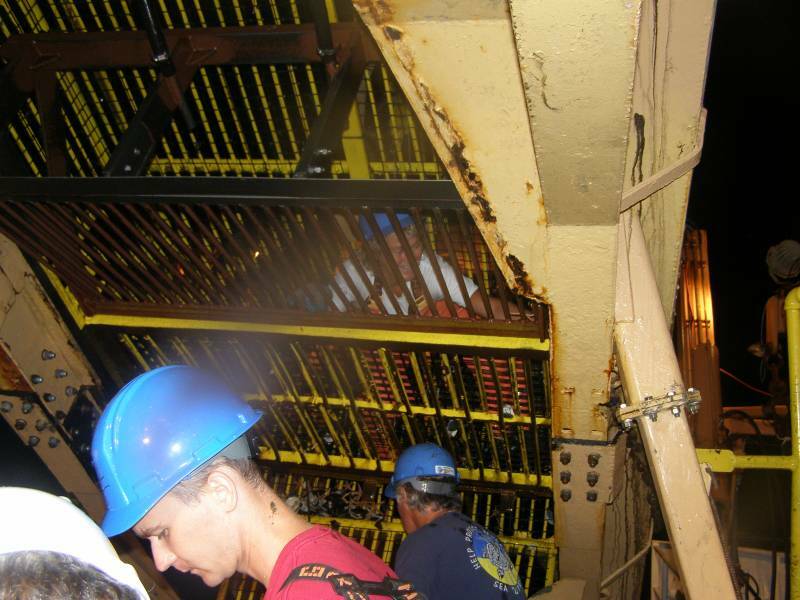 The dredge on the DELAWARE II is big enough for people to stand under and lie on! There are 3 legs to this research survey. I am on the 1st leg. Some general conclusions will be obtained at the end of the 1st leg from the data we collect. Vic Nordahl (our chief scientist) is going to explain these general conclusions to our team; however, more conclusive evidence of the clam survey will be evident after the 2nd and 3rd leg has been completed. On my last log, I plan to show evidence of some of the general conclusions our team has made. How much does the clam dredge weigh? TAS Hylton holds up some interesting specimens that the dredge brought up! Something to Think About: How can we conserve and preserve fisheries along the eastern United States coast? Challenge Yourself: I would like to pursue a career with NOAA in researching and surveying fisheries along the eastern coast of the United States. Fishermen are taking more clams than the clam population can reproduce. Ocean Quahogs (Mollusca), Surfclams (Mollusca), Sand Dollars (Echinoderm), Annelida Polychaeta, Atlantic Sting Ray (Skate), Sea Scallops (Mollusca), and Sea Mouse (AnnelidaPolychaeta). One of the RAINIER’s launches heads out to start surveying the ocean floor. 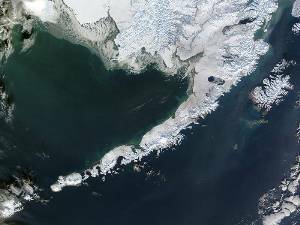 NOAA (National Oceanographic and Atmospheric Administration) Ship RAINIER is currently anchored off of Cove Bay, near the Pavlov Islands, just east of the Aleutian Islands. Our mission is to conduct a hydrographic survey around these islands and collect data on what the ocean floor looks like, which will be used to update marine navigational charts. All marine vessels including, commercial, recreational and government vessels use these charts to navigate around the waters safely, so having reliable, updated charts is very important. 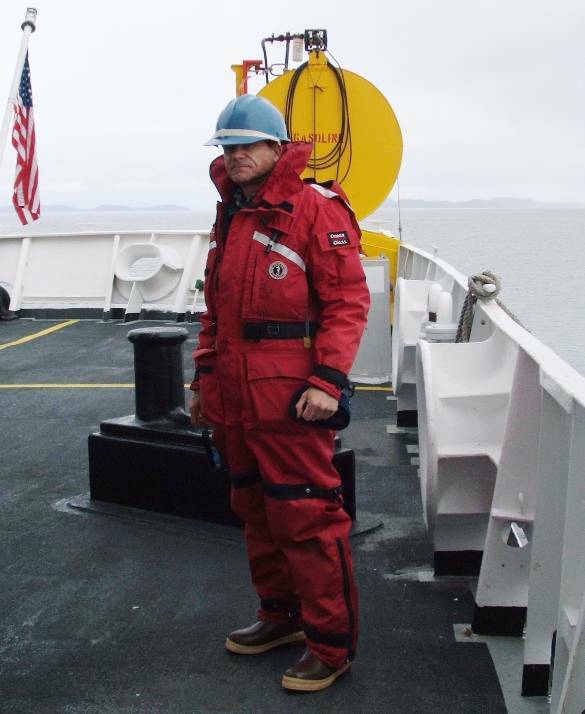 NOAA Teacher at Sea, Terry Welch, assists in a hydrographic survey aboard the launch. 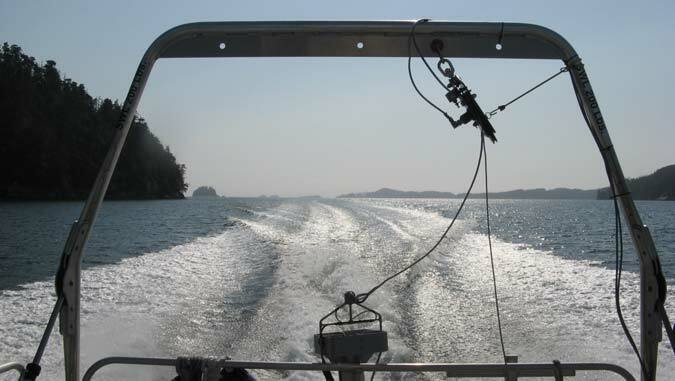 Using Multi-beam SONAR that is mounted to the bottom of several small skiffs or “launches”, surveyors leave the RAINIER and head out to assigned areas. From there, they survey the ocean floor in “lines” that traverse back and forth in the assigned area, much like an aerial surveyor would do when mapping an area by airplane. Sending these small launches out to survey is much more efficient and cost effective since several boats can cover different areas every day. 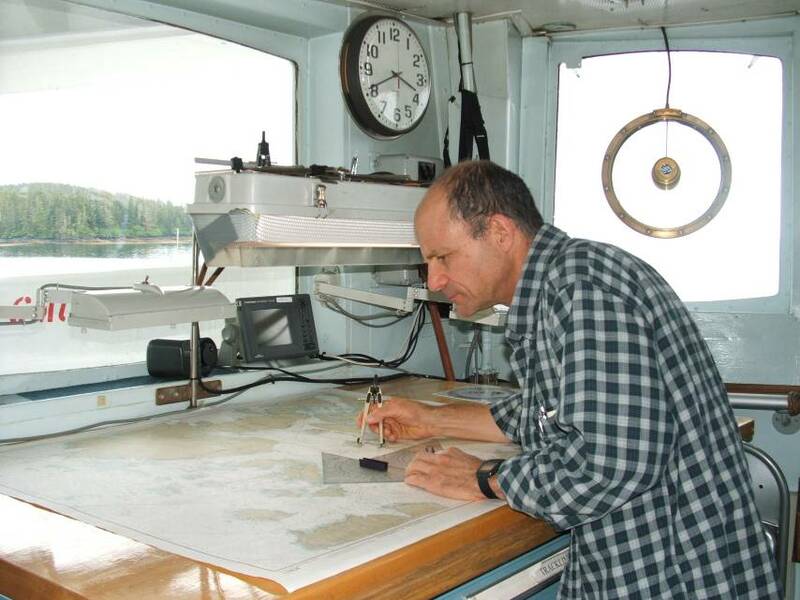 The launches are operated by a Coxswain who follows predetermined lines and the Hydrographer in Charge (HIC) sits at a computer and gathers the data from the sonar system. SONAR uses sound waves that are emitted at regular intervals from the boat and bounce down to the ocean floor and back up. Physical factors such as salinity (saltiness), temperature, and conductivity of the ocean water affect the system, so a special instrument called a CTD is lowered into the water every four hours to gather this data and input it into the system. How salty is the ocean in this area? 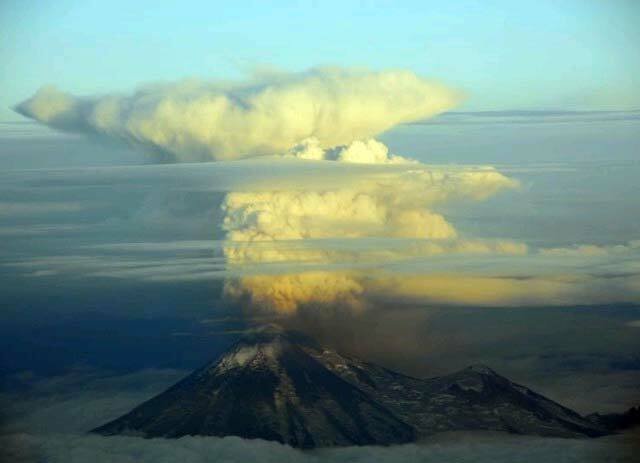 It varies in this area between 14.5 – 14.9%. The day was quite enjoyable and a big learning curve for me. There are a lot of boat terms that I’m learning along with the hydrographic science we do. I’m happy to see that there are many women who work on the ship at all levels from basic seamen (ABS – or Able Bodied Seaman), cooks, to NOAA officers who navigate and run the ship. Women appear to make up 25+% of this crew. All crew have been very helpful and informative. A personal highlight was seeing six Grizzly or brown bears today from our launch boat. A mother and her three cubs hung out on the beach for a while. My camera does not have the best telephoto lens, but you can see a rough picture of them below. It must be a good year for bears seeing that the mother had triplets. When food is more scarce, bears will have less cubs in a season. Question of the Day: Does the ocean salinity (how salty it is) change ocean to ocean and within different depths? New Terms/phrases: Coxswain – is the skipper in charge of a boat, particularly its navigation and steering. Hydrography – the science of measuring and mapping the ocean floor. 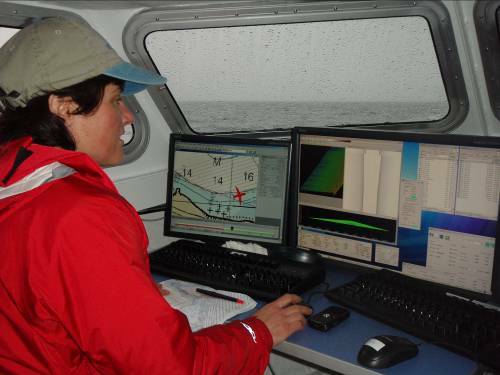 Hydrographer – a person who gathers data on ocean floor features. CTD – Instrument which collects physical characteristics in the sea water including conductivity (flow of electrical current), temperature and depth. This data helps correct for the difference in the speed of sound waves. Sound speeds of sonar vary with depth, temperature and saltiness of the water. SONAR – Sound Navigation And Ranging – similar to echolocation that marine mammals use. 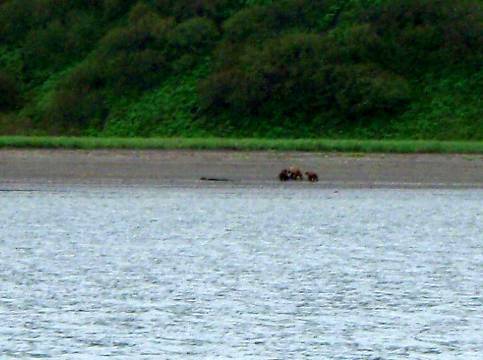 Six Grizzly bears (a mother bear, her three cubs on one beach and two other bears near by). TAS Friedman holds up a macrocystis algae. Southern winds 10-15, Patchy fog, High of 55 º F.
Seas a slight chop with waves of 3-5 feet. We began this nearly two-day journey Wednesday, June 18 after a short day of surveying. The day before, June 17, I participated in a coastline survey team to check on smaller marine anomalies that could be rocks or dense macrocystis algae (A.K.A. giant kelp in southern California) that often appear as a solid formation from aerial observations and laser surveys done by the Coast Guard. 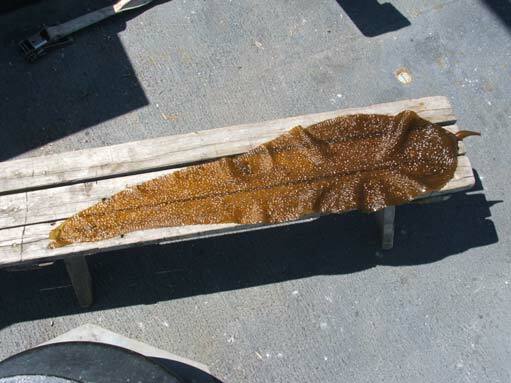 The same macrocystis algae that has fronds (leaves) up to about 18 inches long in California, grows to over three feet up here. Each frond is as large as a tobacco leaf (see photo). My marine biology students back in LA will enjoy the comparison as I am drying some to bring it back. 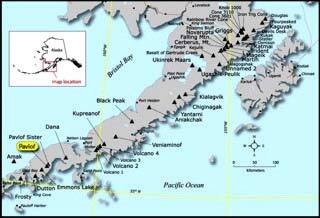 We shall arrive in Kodiak June 20 at 0900, and the crew and guests will disembark to get some land time. Some of us off hiking, others R and R camping, golfing, biking, etc. We’ll return to the ship to sleep and I depart back for LA June 22. My task on board the RAINIER has been successfully completed. It has been to learn as much as I can about hydrography and the charting of nautical maps. I shall be able to share this information with others thru the creation of a lesson plan soon to be available on the Teacher At Sea website. 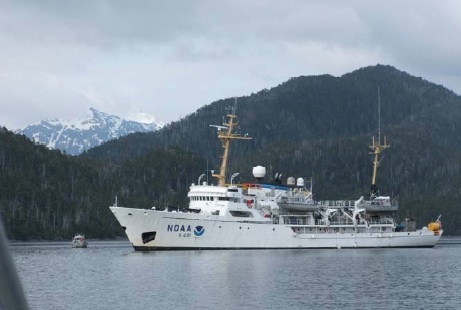 The primary purpose of this lesson plan “Marine Careers on Board NOAA Research Vessels” is to make more available a descriptive motivation of potential jobs and careers that NOAA offers. To accomplish this I developed a questionnaire which 25 crew completed, from the ship’s commander to the entry-level wiper or ordinary seaman. Each interviewee was photographed on the job and both documents will soon be posted on multiple websites and made available to teachers and counselors internationally. There are hundreds of jobs available on NOAA ships and land support positions that are rarely publicized. Through this effort I hope to be part of publicizing NOAA job openings available to any youth over 18. I have been fortunate to be on board this premier NOAA research vessel, RAINIER, for two weeks as an observer and student. It has been an exhilarating experience I shall share with other science teachers individually and at national, state and regional science conferences. The Teacher At Sea program is an exceptional opportunity for teachers to learn and be part of real time scientific research that has concrete and immediate application to understanding the marine environment and the preservation of its character in the face of the human destructive onslaught. I leave a more committed environmental steward, materialist and marine scientist. Please feel free to contact me for any information about the program or materials associated with this experience. Mark Friedman. Mfriedman@animo.org. Here I am studying nautical charts as preparation for the Tidal Gauge expedition. Each day the RAINIER’s “Ship’s Officer,” in collaboration with the field operations officer and the ship’s commander, issue a “Plan of the Day” also known for short as the POD. (Who knows what marine animals move in groupings called a POD? First one to reply from Los Angeles gets a free Alaskan souvenir!) The POD contains important information such as, for Sunday, June 15, Sunrise was at 0415 (4:15 am), and sunset is at 2139 (9:39 pm!) It will be a long day! I rise at 6 am to read the POD and find my assignment. The ship’s position is: Anchored, Palisade Is., AK. The POD also has tide levels, U.S. Coast Guard beacons in the area, the weather, and who the officer on duty is. The weather you ask? How important, especially because many of us are going out on launches and the smaller skiffs for specific assignments. The launch drivers need this especially to make sure all operations are safe. The winds are mild, coming in from the south at 5-10 mph, cloudy with showers, air temperature a balmy 51F with seas of 1-2 foot waves. The POD has major assignments for anchor watch and officers on duty. Safety is a constant refrain as there are anchor watch positions around the clock to staff the bridge (command center) sending regular weather reports to the Coast Guard and National Weather Service and maintaining a secure and safe environment. The POD also lists all the assignments for the launch vessels being dispatched by the mother ship—no not Battlestar Galactica or the Enterprise, but the RAINIER. Today two vessels will be doing sonar readings around San Christoval Channel and North San Fernando Island. The other two, one of which I will be on, is going to remove a tide gauge and do a recon (reconnaissance) mission for a new tide gauge location. Here I am learning to withstand the cold in my Arctic survival suit. 7 am- We are all up for a hearty breakfast, made by three talented chefs (especially in the omelet, soup and dessert department). 8:30 am- With a spraying salt mist and a wind chill factor making the temperature about 20 degrees Fahrenheit, we race up the labyrinth of islands and channels to our destination. A deer and her fawn stare blindly at us on our port side, a humpback whale breaches on our starboard. 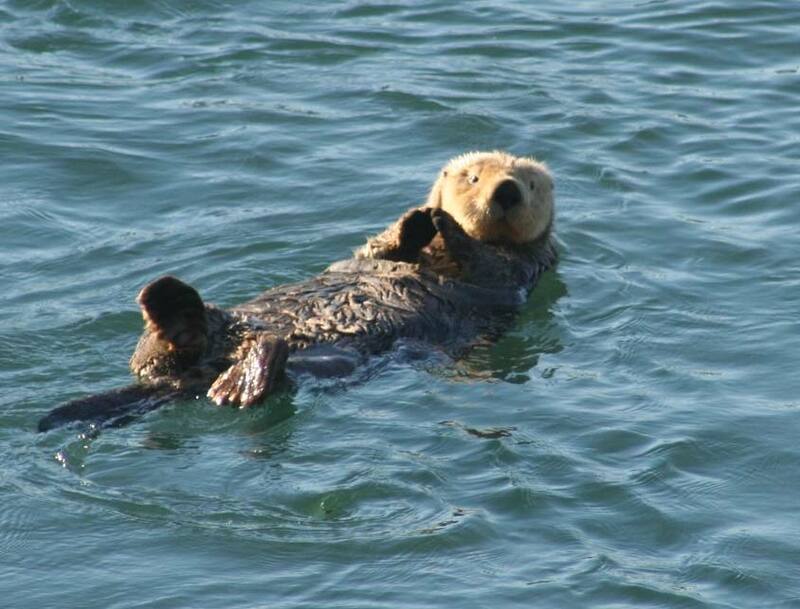 We even glimpse a couple of sea otters playing/rafting in the kelp. 9:30 am- We have reached the tide (marine), or water level, gauge. Our assignment is to remove it after ensuring calibrations have been correct. The tide is coming in and the shore is covered with algae, mini-white barnacles, a sprinkle of clams, a species limpets and small purple mussel beds which are thriving. What is a tide gauge and why are they important? Water level gauges are instruments to measure water surface elevation over long and short durations of time. They have been used for centuries by mariners to improve their knowledge on the depth of water and apply this information to the chart. This information can aide in the calculation of tidal currents, the ebb and flow of water as the tides change. More modern gauges need a power supply to relay information via satellite to appropriate organizations interested in this data. A tide gauge consists of a number of instruments including, foremost, a measured, calibrated staff that is securely mounted into rocks to give a visual baseline of water levels. It is connected to benchmarks by using a survey instrument called a level, which optically measures height differences on a survey rod, which I held during the operations. 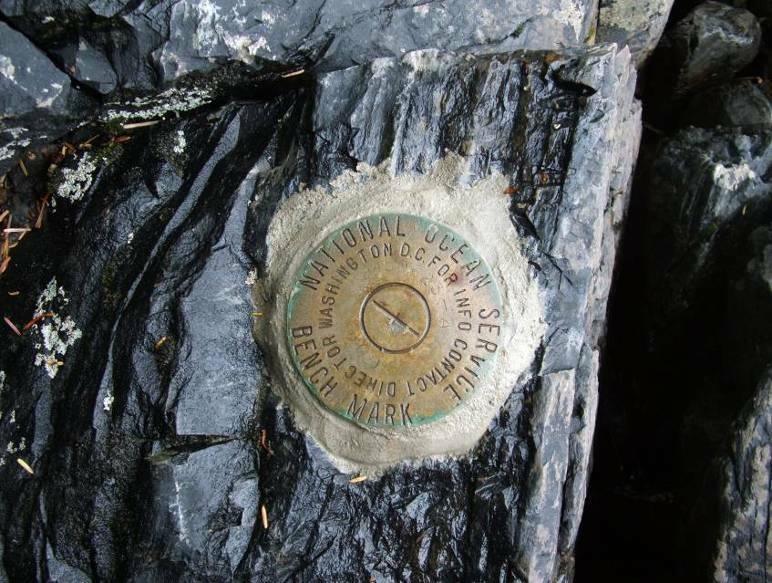 Benchmarks used by NOAA, and previously by the U.S. Coast and Geodetic Survey, are brass survey discs (see photo right) that are imbedded into bedrock and stamped with a code that correlates in NOAA data banks to date of installation, project, location number, etc. Five of them are traditionally imbedded at various locations in the vicinity of the staff. They are leveled between each other and the staff, establishing a mathematical correlation. Gauge measurements are all related to the benchmarks, which hold the permanent datum for the tide station. Another component of the gauge is an orifice (brass pipe with an open end) that is placed where it is continually submerged. 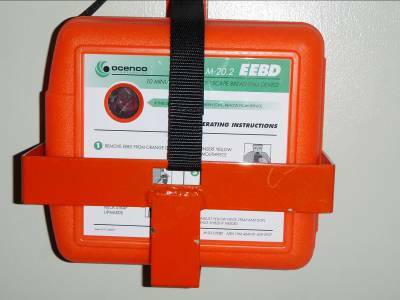 It is connected to an electronic readout instrument via strong plastic tubing that is filled with nitrogen. 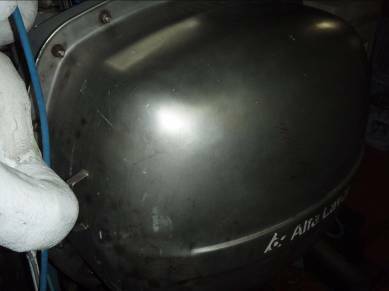 As the gas comes under more or less pressure, based on the pressure exerted by the quantity of water pressing down upon it (water pressure), it registers the height of water levels. (Similar to how air pressure is registered by a barometer, a little remembered instrument but critical to meteorological forecast and studies).The information on depth is thus recorded and electronically transmitted out of the area thru solar powered equipment. In addition to water levels for meteorological (weather) purposes, over time these tidal gauges, when coordinated with others and register actual sea level rise which is now occurring more rapidly due to glacial melting from global warming. They have also been used to register tectonic plate movements. We disassembled the land equipment after completing our benchmark surveys. Later we scouted for a new location further south for a new tidal gauge and benchmark installation site. Then the divers went into action (see above photos). Their job was to retrieve the submerged gauge and piping for future use. In the process they took a video of part of the undersea flora and fauna. 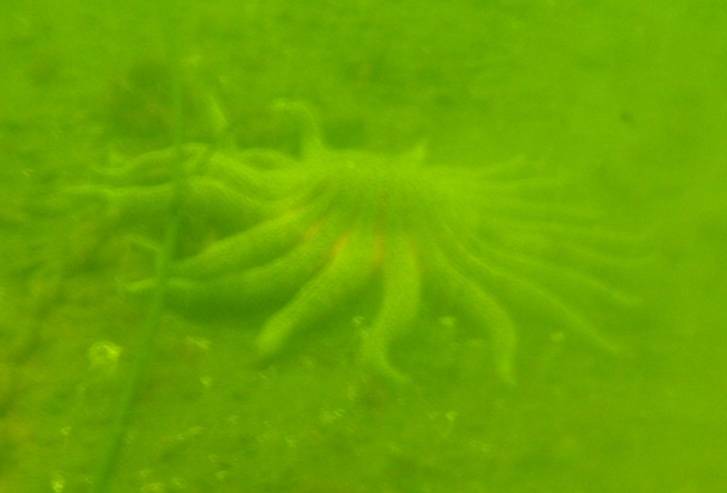 A sun star, a type of sea star, was observed during the tidal gauge dive. We have remained at the buoy site today. We continue to do the meteorological measurements from the bow (sea surface temperature and humidity), we did a single CTD cast just to test that the instruments were working right for the next cruise, and we’ve been monitoring the data from the new buoy and comparing them to data the ship is collecting. The mooring data we’ve been watching especially closely is the wind direction, which was off before we replaced the anemometer yesterday. And it turns out… the wind direction is still off. The two anemometers still record a difference of about 30 degrees. Although it took a few hours to get the first readings, we were immediately skeptical that the fix had worked because the old “broken” anemometer seemed to be in good working condition when it was brought back on board. The trouble is directional (the instrument’s speed measurements are consistent), and it turns out that the compass in each anemometer is influenced by the magnetic field created by the bird wire. Why didn’t they think of this? Well, they did, but the bird wire was not supposed to be magnetic. It turns out that we can deflect a compass by bringing it close to some bird wire. This also means that the other anemometer is probably reading an erroneous direction too, as it is surrounded by bird wire also. So the big wigs are bustling around now trying to make an algorithm to correct the wind direction data. In short, we hope the wind direction readings are always deflected by some predictable amount, so we should be able to adjust the data before using it. Shipboard wind measurements will help calculate the errors. 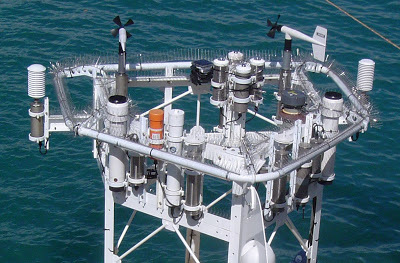 By request, here’s a close-up of the meteorological instruments on top of the buoy. The data that these instruments collect are available in nearly real time for the public to see. Right now, the website is still picking up info from the old buoy, which is sitting on deck and, therefore, not making sense. But if you check this WHOI website later on, you should be able to see graphs of barometric pressure (BPR), air temperature (ATMP), water temperature (STMP), wind speed (WSPD), wind direction (WDIR), relative humidity (RH) and so on. Each quantity is measured by two instruments, so each graph has two lines – hopefully they are close; often they are so close it looks like one curve. But let’s keep an eye on that WDIR – a good algorithm will place the two curves close together. Tonight will be our last night at sea. We’ll leave the buoy area around sunset tonight and head toward Honolulu. We’ll enter the harbor around daybreak and spend the day unloading equipment. June 10: At 7:50 am CO Haines met with everyone involved in today’s launches to talk about the work, weather and safety. Acting FOO Smith covered the particulars of the survey work each launch boat would be conducting. Chief Boatswain Kruger briefly reminded us about safety and being in your positions at the right times, then the order in which the launches would depart from the ship. Very shortly after 8am, we climbed aboard RA-#4 (RAINIER launch boat #4) and were lowered into the water. All six launch boats are similar to each other in that they are about 30 feet long, have built-in diesel engines, a cabin, and a canopy over the coxswain’s wheel. They are housed upon gravity davits, which are not the latest in technology, but very durable and reliable. 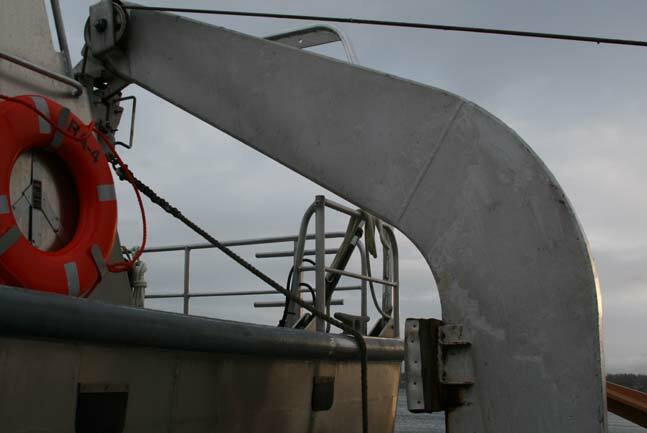 More modern davits use hydraulic systems and they require fewer deckhands to operate. It appears to me that each system has its advantages. Today, we mainly used the side scan sonar system on that boat to survey some of the rocky off shore areas of Biali Rock. RA-4 leaves a trail as it speeds to the assigned survey site. The weather was pretty good except that the waves were 6-7 feet tall, making it a little rough for the new guy. Amy Riley, Lead Survey Technician, invited me below deck to see the work she and Grant were doing. Basically, they had a computer with three monitors, showing the current GPS map of where we were, the scanning in real time and a 3-D image of the ocean floor as it was being processed. The job here for the technicians is to monitor the computers as they accumulate data that will later be processed. But this is not yet the end product. The processed data is finally sent ashore where NOAA cartographers will create the actual charts used for navigation. Even though quite a number of other things were going on in other smaller windows, I’m not above admitting I didn’t fully understand it all! I was allowed to take the tech’s chair for a while and we did 4-5 passes with me in control of the system. Somehow, I managed not to crash us into anything! Later, I sat in on the survey de-briefing in the wardroom. This meeting takes place every day immediately after the last launch returns to the ship. Everyone involved in the launches participates in this meeting. While everyone is given an opportunity to speak about the day, the lead survey technician for each launch specifically makes an official report on accomplishments, areas of interest or concern, problems and/or issues that need to be addressed before the next set of launches departs. I found this part of the day just as interesting because it created a summary for the entire day’s mission. NOAA personnel expertly pluck the stranded fishermen from the sea. 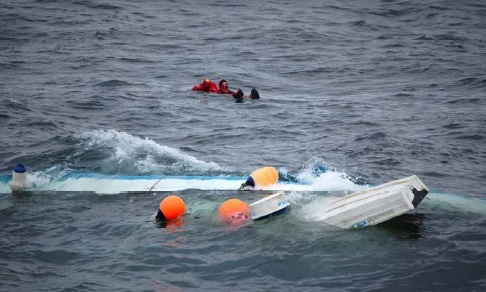 Even as they suffered from shock, they thanked the rescue team profusely for being there. While out on the launch, we were able to catch a little of the radio chatter. It’s always good to listen to the radio, even when it doesn’t pertain to you. It keeps you in the know and alert to possible hazards in your path. I’m adding “listening to the radio” as a rule on my “to do” list, and I’m about to give you a good example as to why. 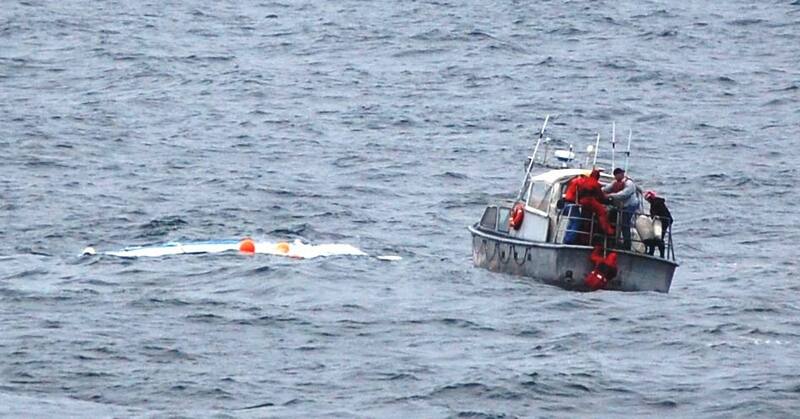 As we listened, it sounded like a “Man Overboard” drill was taking place on the ship. Ha, ha. Better them than us. However, the more we listened, we began to realize we were really missing the event of the day. 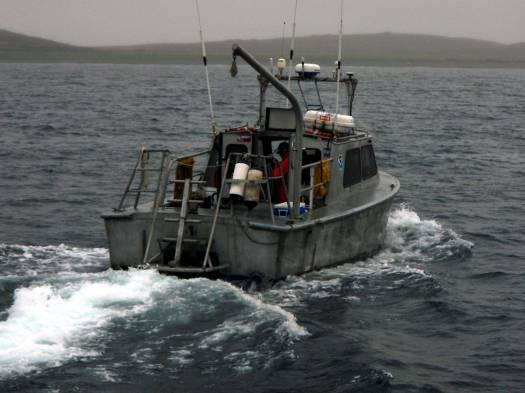 Apparently, two fishermen were out on a fairly old boat when they began to sink. We don’t know the cause, just that it was going down fast. They were able to get out only one mayday call. However, RAINIER’s bridge was able to pick up on and respond to the call. Despite the fact that much of the ship’s personnel were out on launches, a sufficient rescue team was mustered and conducted a flawless rescue mission. The two fishermen were in their emergency immersion or “Gumby suits” and had not suffered too much when they were picked up. After allowing them time to rest and somewhat recover from shock, they were taken to the nearest port. I had read how NOAA vessels frequently play vital roles in various rescue missions, but being here when it happens makes a much bigger impression. Today proved just how easily things can get hairy out here and how important it is to know how to handle emergency situations. Drills and safety meetings occur regularly on RAINIER, and once again, came in very helpful. Ian Colvert, a NOAA Survey Technician was on board RAINIER when the rescue mission took place. He is credited for the rescue pictures. 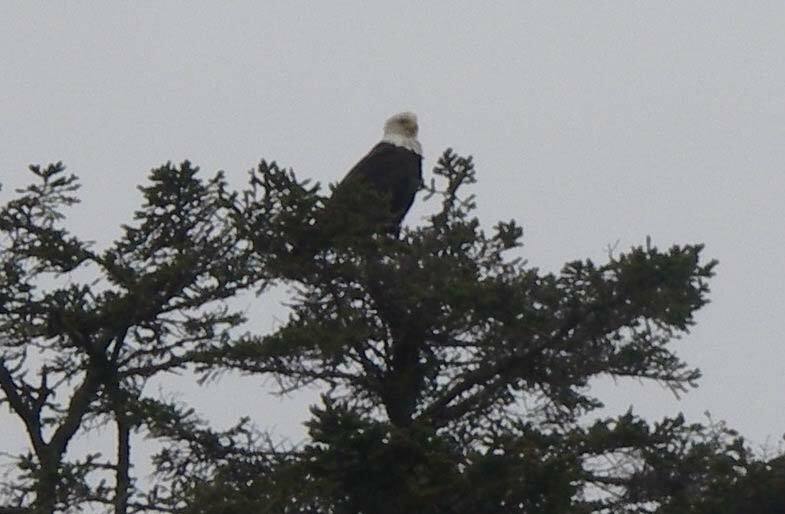 Bald eagles are as abundant here as the crows are at home. I have to diverge a little here. Operating a computer on a wildly thrashing boat was indeed a new experience in and of itself, as well as a point of hilarity for the Lead Technician, Amy, who’s been doing this for a long time. Just working the mouse was like riding Ferdinand the Bull after being stung by an unfriendly bee. Anyway, after an hour of this, I began to get seasick. Yes, the new experiences just keep coming! At the risk of using too many analogies in one paragraph, I will say sea sickness pretty much just feels as if you’ve been traveling in the back of a tired old Chevy Impala being driven through very hilly country roads by a driver who should’ve had his/her license taken away 35 years ago. Basically, puke city. I had to return to the deck where I could see the horizon and let my brain make sense of things again. Recovery was a slow process in 6-7 foot waves, but I did eventually manage and was normal again long before we returned to the relative steadiness of the ship. SONAR – SOund Navigation Ranging – technology which uses sound to determine water depth. Side scan SONAR – a category of SONAR that is used to create an image of a large area of the sea floor. This type of SONAR is often used when conducting surveys of the seafloor in order to create nautical charts for navigation. Gravity Davit – davit system which relies on the weight of the boat to lower it into the water. GPS – Global Positioning System – a mechanism which uses satellite systems to determine location. Coxswain the helmsman or crew member in command of a boat. 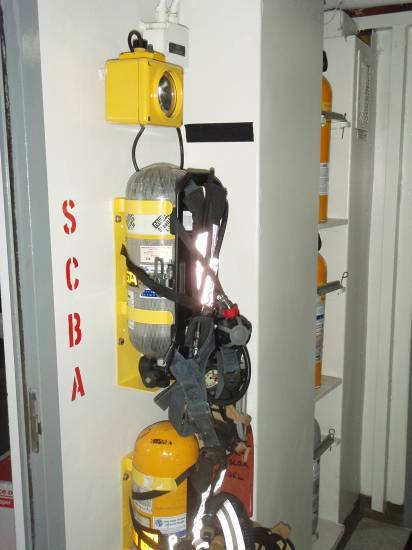 Manual Floatation Device – any life jacket that must be activated by the wearer (usually a rip cord and air canister system) to make it buoyant. Positive Floatation Device – a life jacket that does not require manual activation and is designed to keep the wearer’s head above water. Immersion Suit – a full body suit which functions as a positive floatation device. Used in emergency situations, such as abandoning ship. 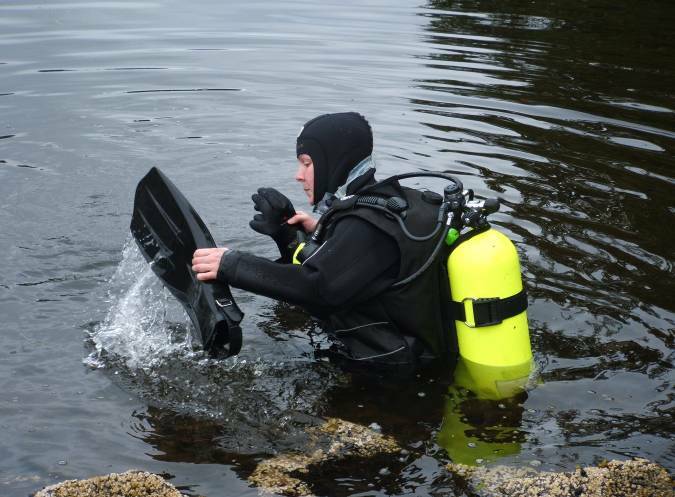 The insulation and water proofing of these suits are important factors in colder waters. Bridge – sometimes called a pilot house, the place from which the ship is steered. This is the heart of ship operations. No new ones, but it was still exciting to see so many. Even though the somewhat higher waves kept me busy with the challenge of standing up, I did notice a large colony of starfish hanging on some rocks in calm waters. There are cold water corals which grow in the Alaskan waters. The Gulf of Esquibel (pronounced “es-ki-bell”) was originally named by Fransisco Antonio Maurelle about May 22,1779 in honor of Mariano Nunez de Esquivel, the surgeon of the ship La Favorita. Alaska itself was purchased by the United States from Russia in 1867. Sea otters bathed and ate nonchalantly on their backs as we passed between the islands.